After the festive season, we often dream about booking a holiday in the sun with our families. However, as the majority of us have spent too much money over Christmas, we often push this idea to the back of our minds. As it can be easy to overspend when you are on holiday, especially if you take credit cards along with you, it’s imperative to come up with a daily budget which you can stick to. If you don’t, you may have a nasty surprise when your next credit card bill arrives on your doormat. Consider getting a pre-paid credit card before you go away. Opting for this type of card can ensure that you don’t go over your budget, especially if you want to enjoy the holiday and return home without any extra debts. Also avoid using your mobile abroad if possible in order to save money. You can communicate with friends and family on social networking websites such as Twitter and Facebook instead. Using email is another way to reduce communication costs. It is often feasible to book a holiday when on a limited budget, but you will need to know the right way to go about it. Booking ahead and being determined to find a good deal will ensure that you and your family get the holiday you deserve. To get some extra cash for your holiday, why not sell some of your old gear like games consoles or music players rather than have them just taking up space in a cupboard? 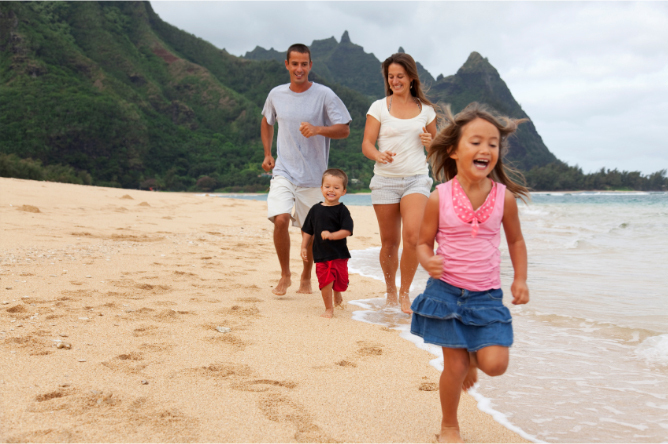 Here are some tips on how to get cheap family holidays when on a budget. When deciding on the type of accommodation you would like to stay in during your holiday, you will need to decide whether a self-catering holiday will work out cheaper than an all-inclusive hotel. Although it can prove to be cheaper to go for a deal which includes all of your expenses, it can sometimes cost less to stay in self-catering accommodation. Self-catering can also prove to be worthwhile if you are planning on exploring the local area, and allows you to have more spending money when you are visiting the local attractions. If you prefer to stay by the swimming pool at your resort, an all-inclusive holiday could work out to be cheaper. Taking advantage of a back packing lodge is an alternative way of spending less on accommodation expenses, although this may not be the best idea if you are traveling with younger children. Ensure that you do your research ahead of time and decide whether a back packing lodge is good for you and your family before you make a booking. You can save even more money by searching online for promotional codes. Many travel companies have discounts to attract new customers, so shop around for the best offers online. You and your family don’t always have to travel abroad in order to have a great time. There are plenty of attractions to see and experience in the United Kingdom, many of which won’t break the bank. Decide on a list of locations that you have always wanted to visit in the UK, and then decide whether a staycation will be as fun as travelling abroad. Remember to consult every member of your family and come to a joint decision on the best course of action to take. Many holiday parks in the UK also offer the chance for you to go “glamping”, a new spin on conventional camping. You can stay in a Mongolian style tent called a “yurt”, which contains many home comforts, rather than sleeping on the ground in a sleeping bag. Planning ahead can often save you cash on your holiday. Book your flights and accommodation as early as you can in order to make a substantial saving. Do your research to find a holiday deal which will cater to your budget, and don’t always book the first offer that you see. Alternatively, book a last minute holiday, which can be a great way to save money. Travel companies often reduce their rates because they want to fill empty seats, ideal for travellers who don’t mind booking a holiday and travelling at the last minute. Whatever you decide to do, ensure that you have the necessary travel insurance in place to protect you when you are on holiday. There is nothing worse than experiencing an emergency abroad and having no way of rectifying the situation.